I have two ways of thinking about clouds. The first is a Geography student and later Graduate fascinated by all aspects of our physical environment. What sort of clouds are overhead? What could that herald in the weather? Are we likely to experience thunder & lightning or worse, a West Midlands Twister (it always seems to be Birmingham* that gets hit. Is this some form of Divine Retribution?)? How many octas cloud cover are there. Rational things. Interesting to me; interesting to Tomasz Schafernaker** and probably still interesting to one of my old Geography teachers, Mr Lonsdale. But probably not interesting to a broader set. The second is more absolute. Noticing clouds; enjoying them for what they are and most importantly how they frame the world that we look at. As I look out now, it’s almost a nursery school imagining of what clouds should be like: fluffy cumulus clouds, all rocky headed like cauliflower, tipped below with a minor threat of grey but otherwise bouncing along against a blue sky. Below, a stand of ancient trees – oaks and ash mainly – and to the side ‘Staffordshire Blues’ – not butterflies but tiled roofs, typical round this way. But two clouds have alluded me. Oh, gosh, by writing that I sound like a cloud-catcher, but that’s not it. Here in the UK, we enjoy most clouds: from skittish cirrus, heralding yet another bout of rain, to hammer-headed cumulonimbus in deep Summer. Sometimes, in the hills, I’ve enjoyed the clouds below me, as I’ve ridge walked. But to this day, I’ve seen neither lenticular clouds nor noctilucent ones. Lenticular are saucer shaped ones, often in the lee of a mountain range: UFO like. For many years I travelled regularly to the American mid west and the foothills of the Rockies. Always glancing up but never seen. 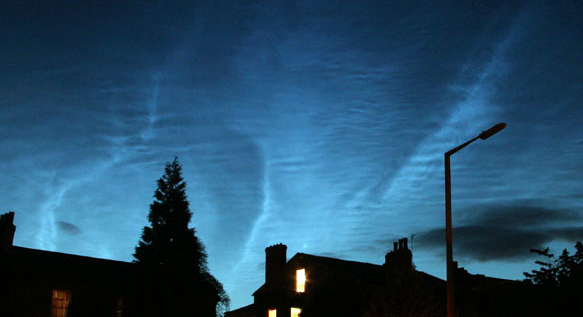 But last night, just briefly, I saw noctilucent clouds – just briefly and quite serendipitously (OK, I got up for a wee in the night. Happy now?). These are possibly the most magical: when the sun sitting below the horizon lights up ice crystals high, high in the atmosphere, effectively lighting the clouds from below. The image is not mine, I couldn’t make a dash for the camera without disturbing the dog – but gives you an idea of why dedicated cloud spotters live a nocturnal life in the British Summer. * As in Birmingham in the historic county of Warwickshire not Alabama – they’re probably as common as muck there.